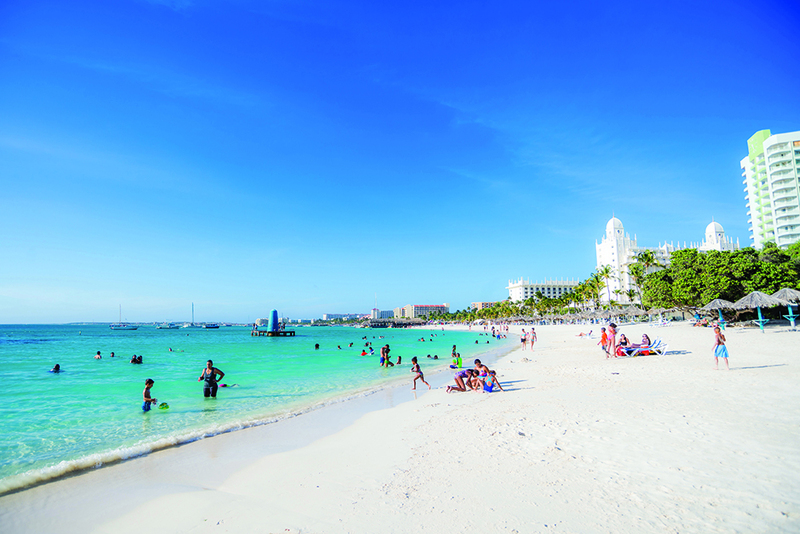 Aruba offers thrills and chills to the daring and fit, and easy outdoor fun to those with relaxation in mind. For every mountain biker negotiating rocky roads, and skydiver and parasailer enjoying a bird’s eye view, there are those strolling along the beach in quiet contemplation. While landsailors challenge the wind and hikers discover the challenging secrets of Arikok, kayakers and stand up paddleboarders prefer to just tune out. 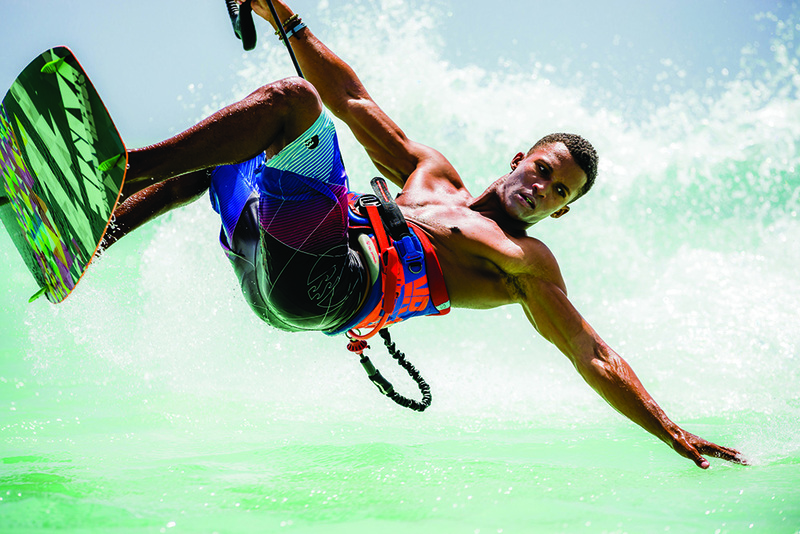 The energetic can make waves on a jet ski, waverunner, banana boat or tube; or hover above the surface in a water-propelled jetpack; others prefer to relax on a helmeted underwater walk or hooked up to a SNUBA harness. Quiet lounging, sunrise or sunset swimming and beach yoga may relieve stress, but the action is all around. Glistening bodies, icy beers, flying sand, cool music and good-natured camaraderie describe the beach scene. Exuberant games of beach tennis, volleyball and soccer work up a thirst. On De Palm Island, the water park with six riveting waterslides will take your breath away. Sailing charters offer catamaran sail and snorkel excursions, including lively music, open bars and snacks or light lunches. Marine lovers can discover Aruba’s colorful underwater realm without getting wet on air-conditioned boats; the Atlantis Submarine Tour that descends to a depth of 130 feet and Seaworld Explorer that remains above sea level while its hull affords spectacular underwater views. 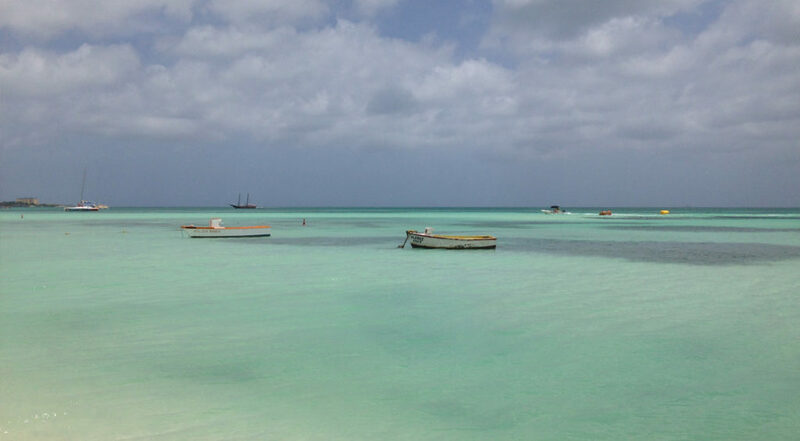 Aruba ranks high as a windsurfing destination in light of its flat-water locations, challenging wave conditions, extensive shallows and constant trade-winds averaging fifteen knots year-round. 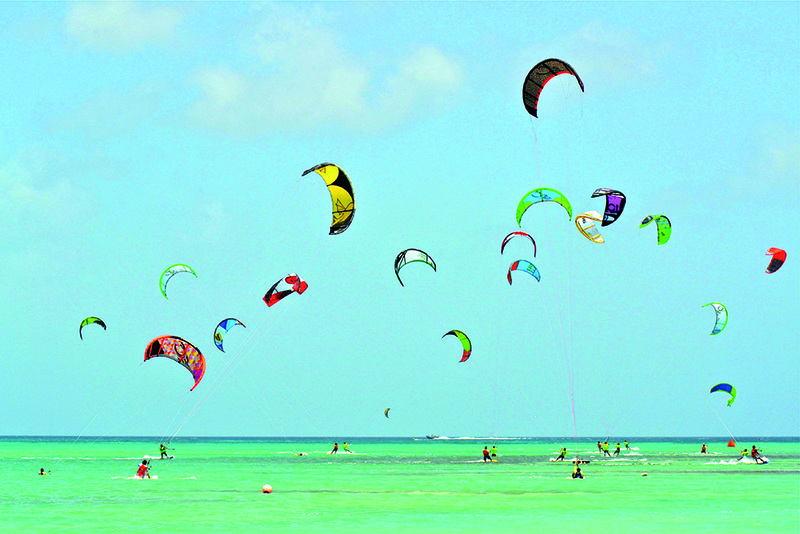 Avid windsurfers slice the water and kitesurfers flirt with the trade winds throughout the year. Hadicurari Beach (also known as Fisherman’s Huts) is known as the place to put athletic skills to the test. Inlets along the opposite windswept coast attract body boarders and surfers. Good visibility, several shallow reefs, and captivating shipwrecks give snorkelers an array of options. Most sites are on the southern, or leeward, coast. Slightly north of Palm Beach, Catalina Bay and Arashi Reef are home to a host of brilliant marine life. Reef, shore and wreck diving reveal an unimaginable underwater fantasy. Aruba is touted as the wreck-diving capital of the Caribbean; the entire south coast is a coral reef with twenty dive sites and eleven diver-friendly wrecks. Dive operators offer expert instruction and PADI and NAUI courses including Open Water and Rescue Diver Certification, as well as basic bubble-maker and refresher courses. Resorts offer beginner courses in swimming pools. For deep-sea fishing, half and full-day excursions go five to seven miles offshore. Game fish catch includes sailfish, marlin, wahoo, shark, barracuda, kingfish, and yellow fin tuna. Enjoy bottom fishing on a sports yacht where equipment and bait are provided for reeling in snapper and grouper. Extreme sports enthusiasts will enjoy twenty-one rugged miles of hiking trails in Arikok National Park and the invigorating climb up the Hooiberg, the island’s second highest point, and exploration of the caves along the northeast coast. Designated as an environmental sanctuary more than twenty years ago, Arikok is a natural preserve that covers one-fifth of Aruba. With 29 miles of rocky hiking trails, adventurers discover the park’s otherworldly rock formations, bizarre cactus groves, fluorescent parakeets and lizards. Offering a birds-eye view at 620 feet, hikers discover sheer serenity atop Yamanota, the island’s highest elevation point offering picture-perfect panoramas. 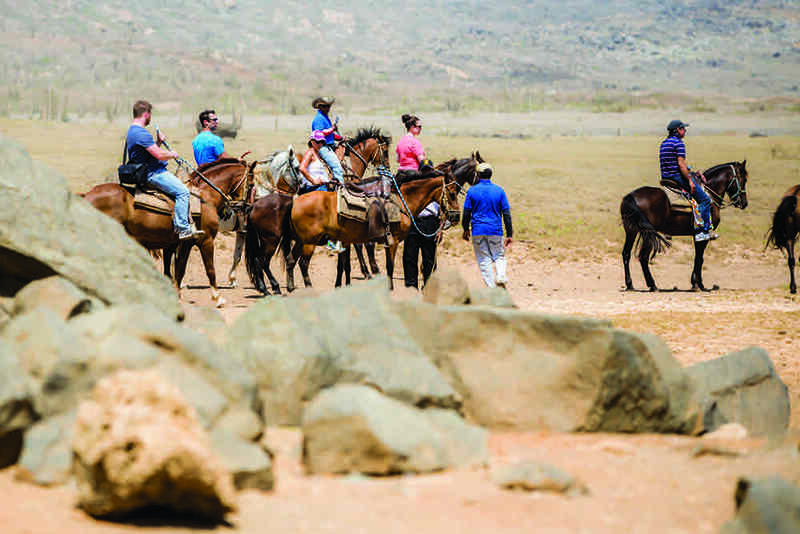 While horseback riding near the hotels is scenic and sociable, rides along the windward coast are best left to seasoned equestrians. Thrill-seekers can trek through the rugged and wild outback on a 4×4 Jeep safari, ATV or UTV tour over canyons and jagged rocks. Aruba’s golf courses can be more than challenging with constant breezes and blazing sun. Steps away from the beach, The Links at Divi Aruba boasts manicured emerald greens, play-over water and beautifully landscaped lagoons. Tierra del Sol is an 18-hole desert course with sweeping sea views. 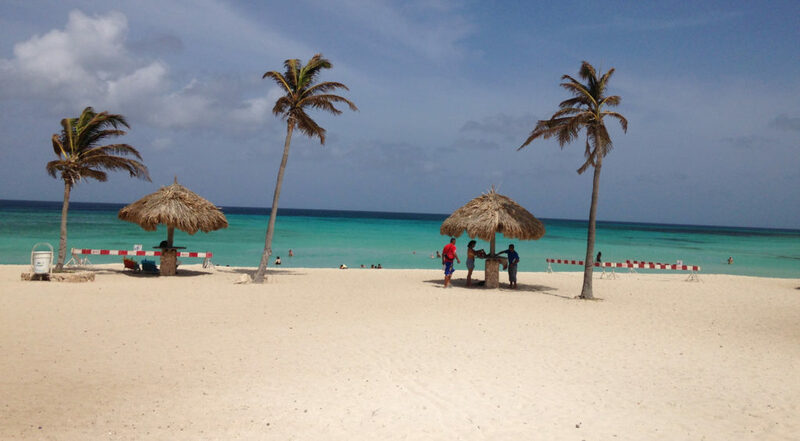 For more vacation inspiration, check out our post on 12 of the best things to see around Aruba here.